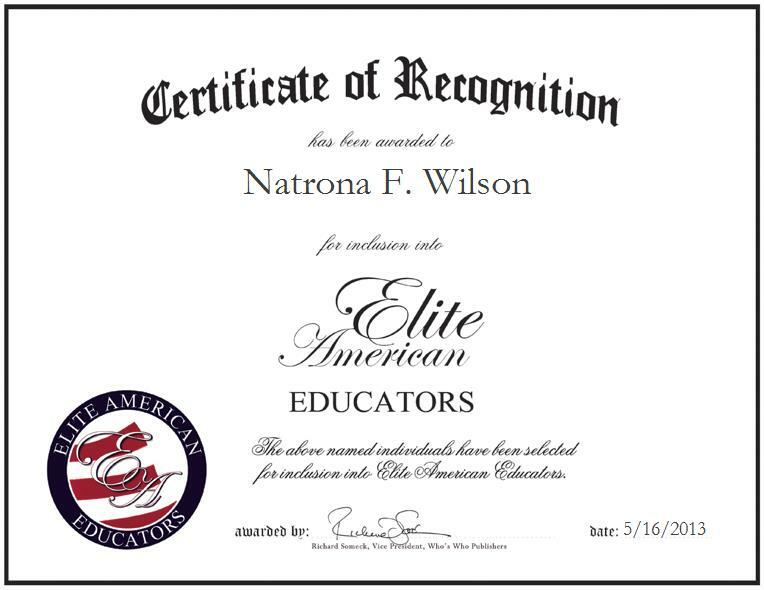 HIGHLAND, IN, May 16, 2013, Natrona F. Wilson, Academic Coordinator at Purdue University, has been recognized by Elite American Educators for dedication, achievements, and leadership in higher education. Specializing in computer graphics and the instruction and administering of educational programs, Ms. Wilson shines as a luminary in her field, bringing forth a wealth of knowledge and experience to her current role. She is proud to be able to help students to achieve their academic goals by giving back to the same educational community in which she was brought up. Ms. Wilson earned a Bachelor of Arts and a Master of Science from Purdue University, and she continues to strive for excellence in her endeavors at the renowned institute of higher learning. Ms. Wilson remains abreast of trends and developments in her field as a member of the Mid-America Association of Educational Opportunity Program Personnel, and the Purdue University Alumni Association. Ever committed to serving as an agent of positive change, she feels thrilled to serve in a capacity in which she is able to give back to students, and make the difference that she would like to make in the academic community. She also enjoys working on computers, listening to music, taking artistic and creative photographs, and making crafts.